Toasts are the rage if you believe the food magazines. I believe it started out with smearing avocado on toast for an healthy snack. 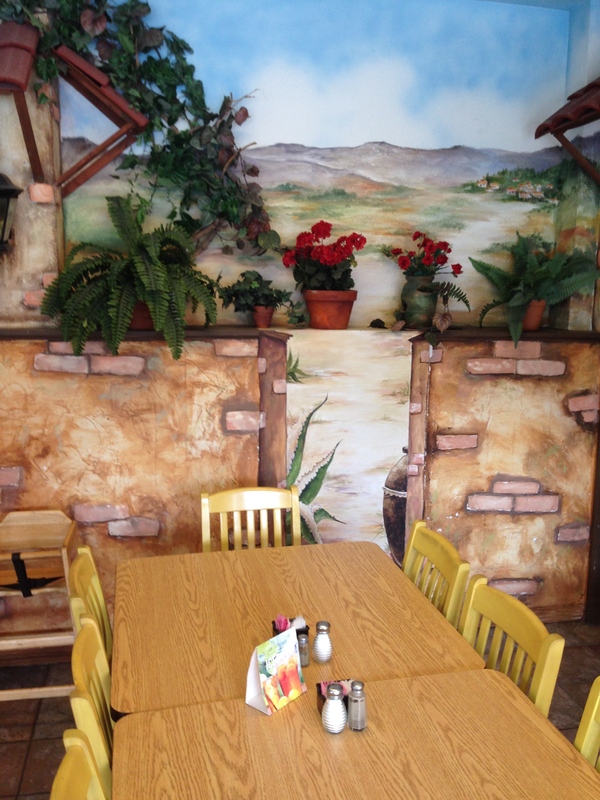 Then other things came along including white beans on toasted baguette slices and even refried pinto beans which have long been spread on bollio rolls in Mexican restaurants. One of my favorites is borrowed from the French – butter on radishes. I wish the markets would carry French breakfast radishes, but they have to be grown in your own garden if you want to enjoy them with a dab of butter right on the radish in my part of the country. Even everyday grocery store radishes meld well with butter on toast. I had a few radishes left over from a beet, radish and radicchio salad and could hardly wait for breakfast this morning to make radish toasts. 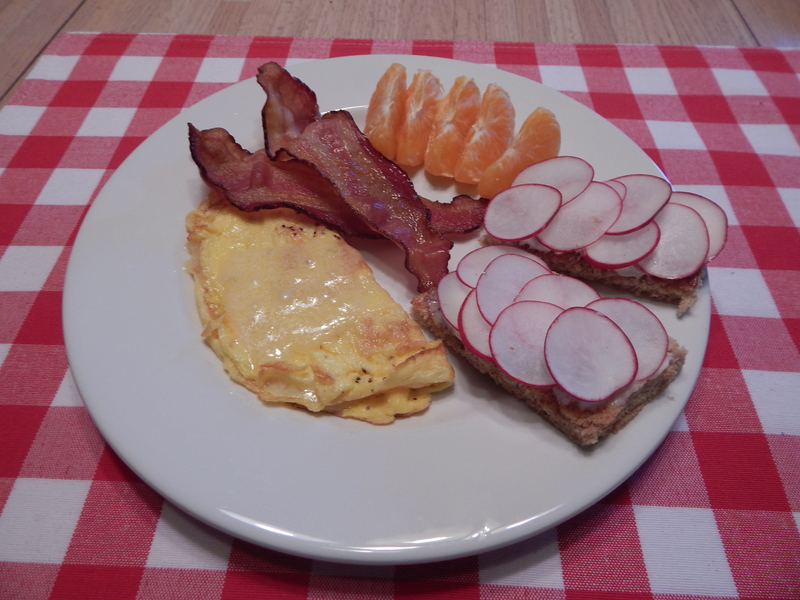 Breakfast: One egg and white cheddar omelette, two rashers bacon, tangerine slices and radish toasts. Thanks, Darryl, for the reminder that citrus negates cholesterol. Softened spreadable butter for slathering on toast. Let you conscience guide you about how much butter to slathe, but do try to be generous to yourself. A very light sprinkle of finishing salt is nice if your spreadable butter is unsalted. Toast bread, trim and slice, spread with butter, arrange radish slices on butter. Eat. One of the food magazines has a series of articles on the healthful properties of colorful vegetables. Rounding out the articles are three recipes for pasta with vegetable toppings carrying out the color themes of green, purple and orange. 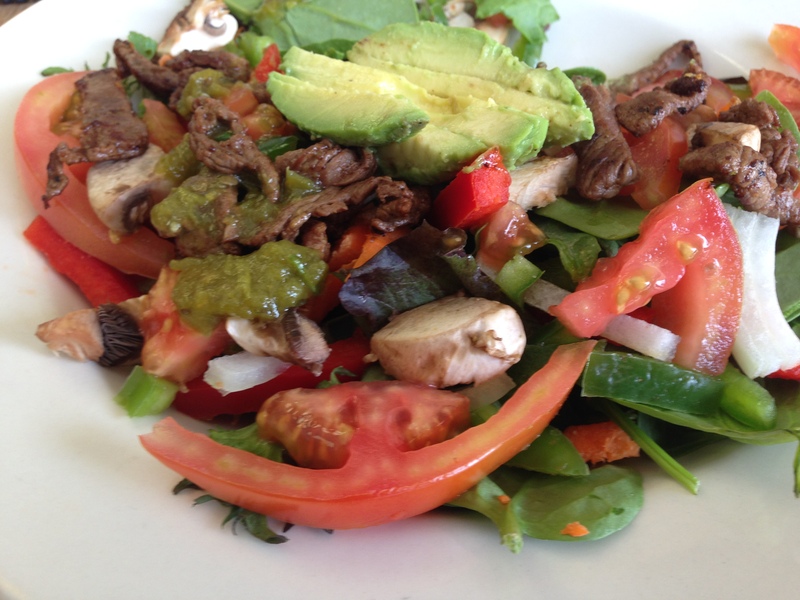 Who could resist jumping into making something with vivid veggies? I started with the purple recipe. 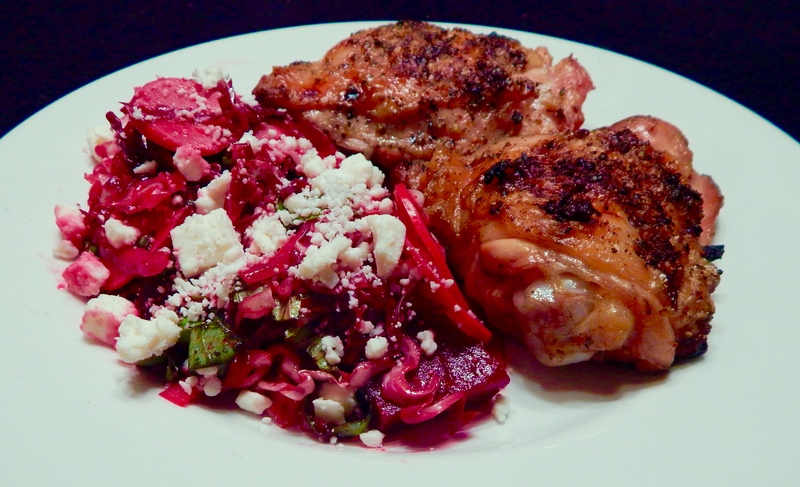 It has beets, radicchio, radishes and red onion for color. All happen to be on my list of favorites. I studied the magazine photo and the recipe and decided this is not really a pasta topping; it is a salad recipe so I did a little tweaking. The original sautés the red onion and sliced garlic. I decided to forgo cooking the onion and didn’t used slices of raw garlic. I kept the rest of the ingredients, and with the exception of the beets, everything was raw. Protein for the meal was chicken thighs with a Meyer lemon rub grilled over indirect heat. If you hadn’t noticed, I grill almost year ’round and I really like dark chicken – thighs and sometimes leg quarters. Salad of beets, radishes and radicchio with ricotta salata and basil goes beyond purple. 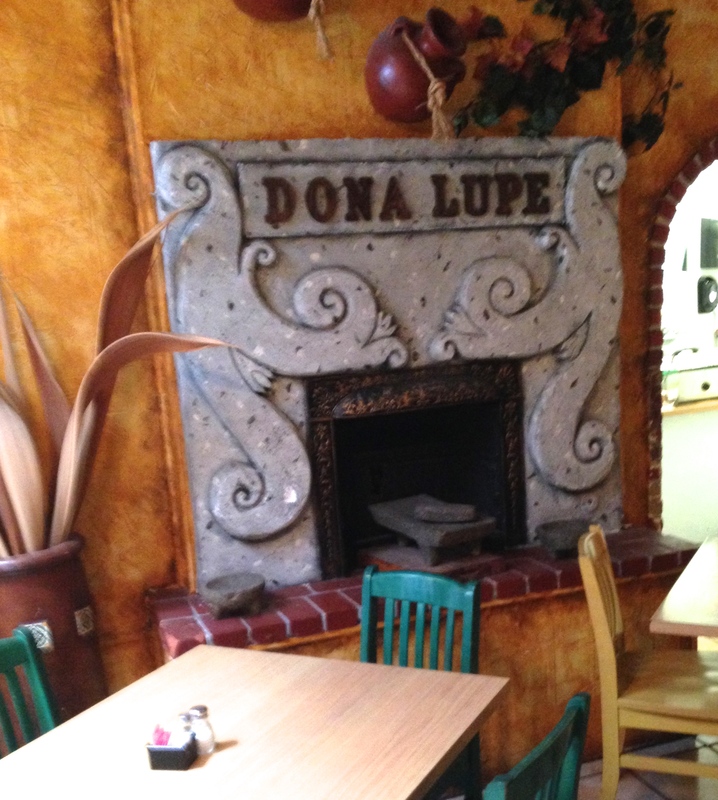 Heat oven to 400º. Wash and trim greens from beets leaving a stub of stems and the root, and roast, covered, in a casserole dish for 40 -50 minutes until they can easily be pierced with a paring knife. When done, remove to a plate and let cool. If they are fresh, you can cook the beet greens as you would other leafy greens. Core and slice the radicchio. The head I used was on the small size so I used it all. Had it been larger, I’d have saved half to cook on the grill another time. I used the thickest setting and the hand guard on my mandoline to spread the radicchio. I peeled and halved the red onion and used the middle thickness on the mandoline to slice it. Beat together the olive oil and red wine vinegar. Toss the radicchio, radishes and onion in the emulsion with a little salt and fresh ground pepper. Refrigerate while the beets finish cooking and cool. Sitting in the vinegar and oil for a bit will tenderize the vegetables a little. When beets are cool enough to handle, rub the peel off with you hands, trim the stem and root ends off. Halve the beets and slice into thin half-rounds. Coarsely chop the basil and gently fold it and the beets into the other vegetables and dressing. If you accumulate any beet juice in the process, add it to the salad with the beets and basil. Plate your salad and sprinkle with crumbled ricotta salata. If you toss the cheese with the salad, you’ll have pink cheese instead of white. *I’m going to make toast sticks (trim crusts off toasted bread and cut into two or three sticks), spread them with butter and top with sliced radishes to accompany breakfast this morning. Toasts and toppings are trendy right now and avocado toasts seem to have been surpassed by other veggie slathers. This recipe sounded like fun when I stumbled across it. I printed it and now I can’t find the copy or think where I might have put it. I made it from memory and it worked. 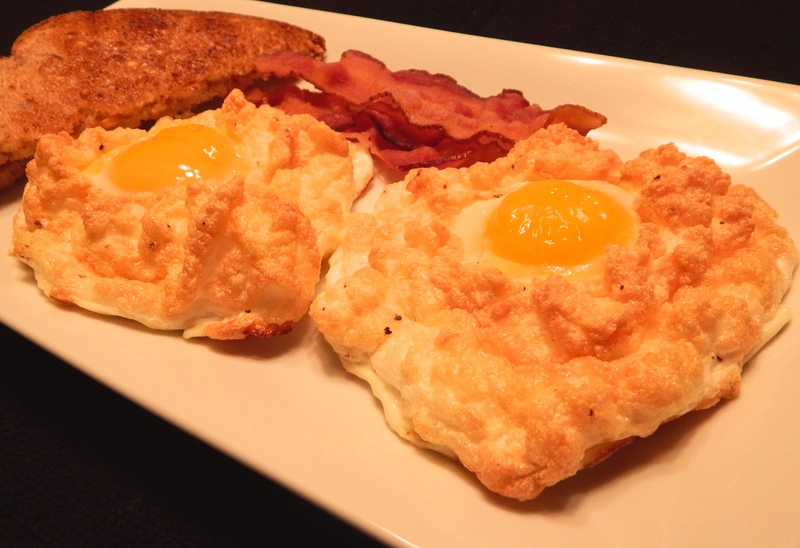 Eggs in a cloud with a side of bacon and toast = Sunday breakfast. It’s pretty simple; beaten egg whites with a little parmesan cheese, salt and pepper gently folded in. Egg white clouds spooned on a parchment paper-lined baking sheet. Bake the whites until set, but not browned, add whole yolks to the whites and bake until the yolks are at your favorite stage of doneness. Plate them with the sides of your choice and dig in. Preheat oven to 375º. Choose a sheet pan large enough to hold four mounds of beaten egg whites about an inch apart and line it with parchment paper. Beat eggs until stiff peaks form. Gently fold in parmesan cheese and a little salt and pepper. Spoon four mounds onto lined sheet pan. Make a depression in the top of each mound to hold the yolk after the whites have set up. Bake mounds (clouds) for about five minutes until they have set but have not begun to brown. Carefully spoon one whole yolk into the depression you made in each mound. Return to oven for three minutes or more depending on how soft you like your egg yolk. Whites will brown a little while the yolks bake. Remove pan from oven and let clouds sit for a moment or two, then with a spatula, transfer clouds to plates. Add side dishes and enjoy. Meatless Monday at My House? I’m an omnivore leaning toward carnivore, but sometimes I enjoy a vegetarian digression. That happened last night. I found a recipe for a leek and herb fritatta that sounded too good to pass up. Leeks are so subtle and so delicious, I should use them more often. My herbs are combing back from their winter rest. Chives, thyme and oregano are greening up and starting to grow. I found French tarragon at the nursery that I have to get it into the herb pots soon. I think it is safe to put out basil now so I’m excited about fresh herbs again. This fritatta recipe called for leeks, thyme, chives, basil and parsley and a little parmesan cheese. Who could resist that! Leek and herb frigate right out of the oven with just added herb garnish. 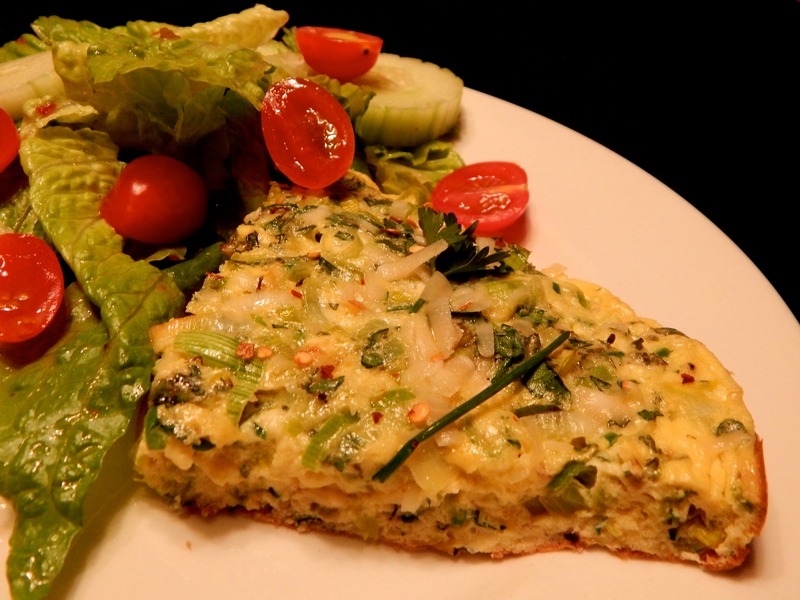 The frittata with a simple side salad made a great spring supper. The fresh herbs and the silky rich leeks were amazing. Preheat oven to 450º, heat olive oil in an ovenproof 10 inch skillet over medium heat. Add the leeks and cook, stirring until softened (abut 15 minutes). Reduce heat as needed to keep leeks from browning too much. In a bowl, beat eggs to blend the whites and yolks, add chopped herbs and Parmesan cheese, salt and pepper and stir or beat into eggs. Pour the egg mixture into the skillet and stir to distribute the leeks evenly. Reduce heat to low and cover the skillet loosely with a lid. 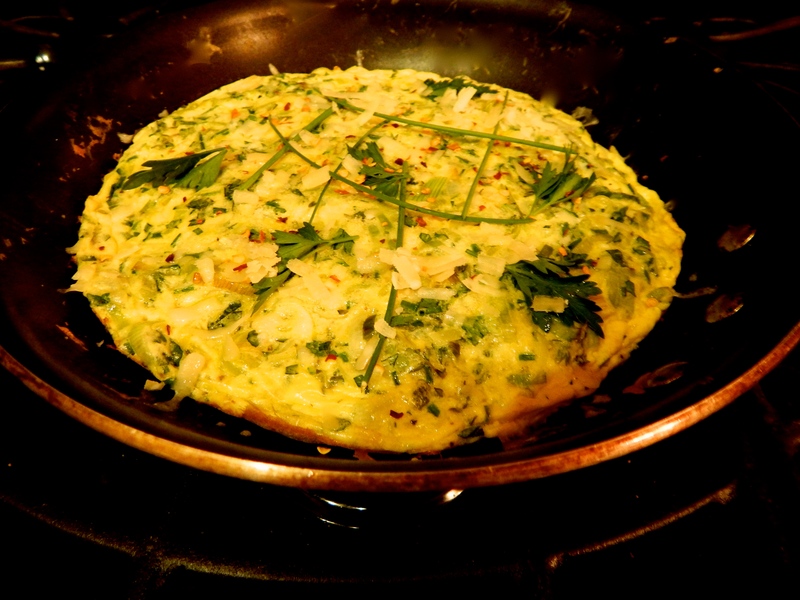 Using a spatula, occasionally lift the edges of the frittata to allow uncooked egg to flow underneath. When the edges and bottom of the frittata are set and the center is still moist, remove the lid and place the pan in the oven. Bake until the top is slightly colored and the center is firm, about 5 minutes. Garnish with more fresh herbs and uncut chives. You may add a sprinkle of red pepper flakes and Parmesan shavings if desired. 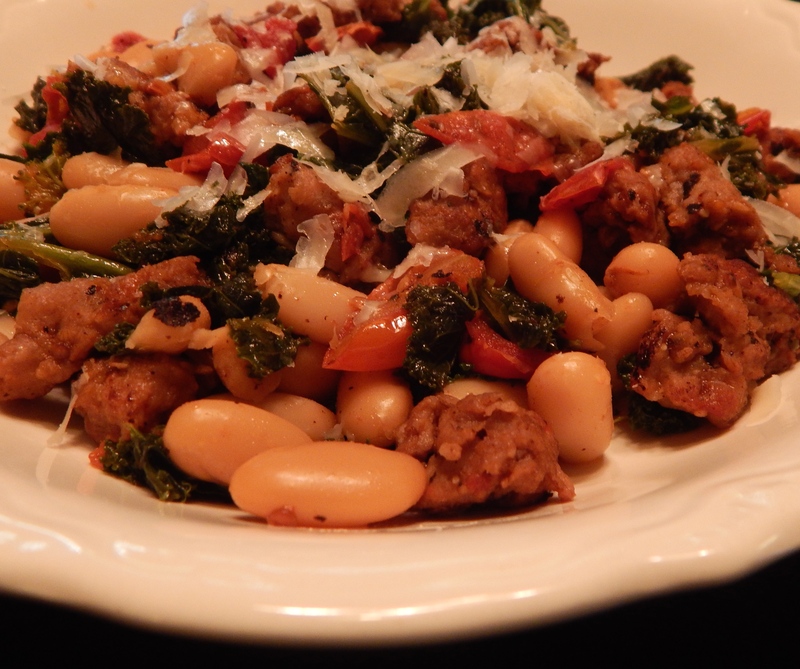 During cool weather, I like to make a quick soup of chicken broth or stock, sweet Italian sausage, chopped greens and cannellini beans. I’m sure I’ve posted it here before. I also like to make a blistered tomato sauce with sliced grape tomatoes or diced garden fresh tomatoes in season. 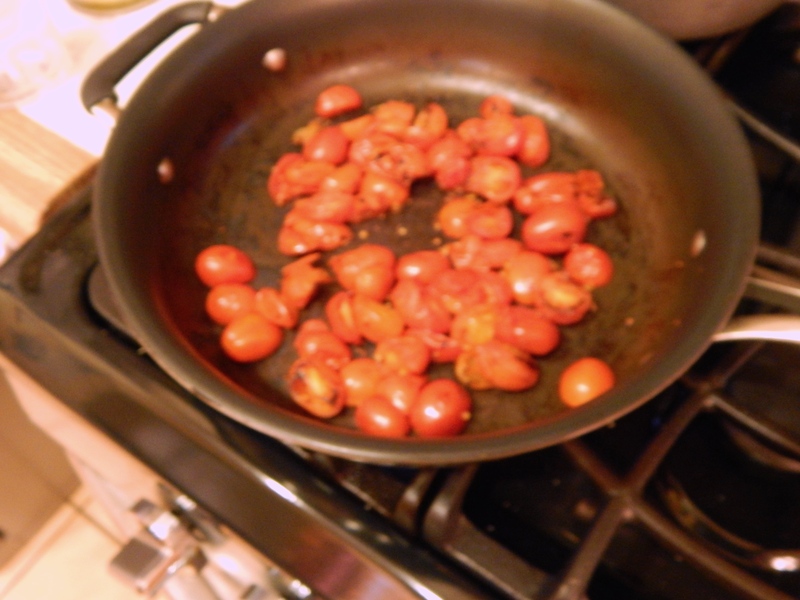 I put the tomatoes in a hot dry pan, and let them yield their juices and take on a little char. Then I add some minced garlic, let it bloom and add just a little water and scrape the fond (stuck on bits) from the bottom of the pan. It reminds me of sun dried tomatoes. The sauce is good on pasta, of course, but my favorite was to use is with steamed julienned zucchini, yellow squash and carrots. I had all the ingredients for the soup on hand, but didn’t really want a soup on a warm spring evening. I decided to play around a little and combine those favorite recipes. I blistered the tomatoes and garlic, keeping it on the dry side, and then set it by while I worked on the rest of the experiment. I removed the casings from a couple of links of Sicilian sausage, broke them up and browned them in a separate pan. I steamed stemmed and torn kale and washed a can of cannellini beans. 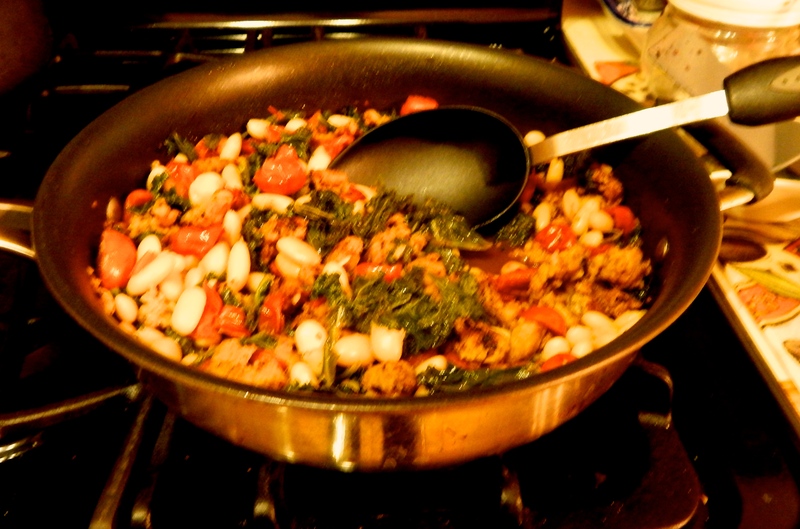 When the kale was tender, I added everything to the tomato pan with a splash of chicken broth. 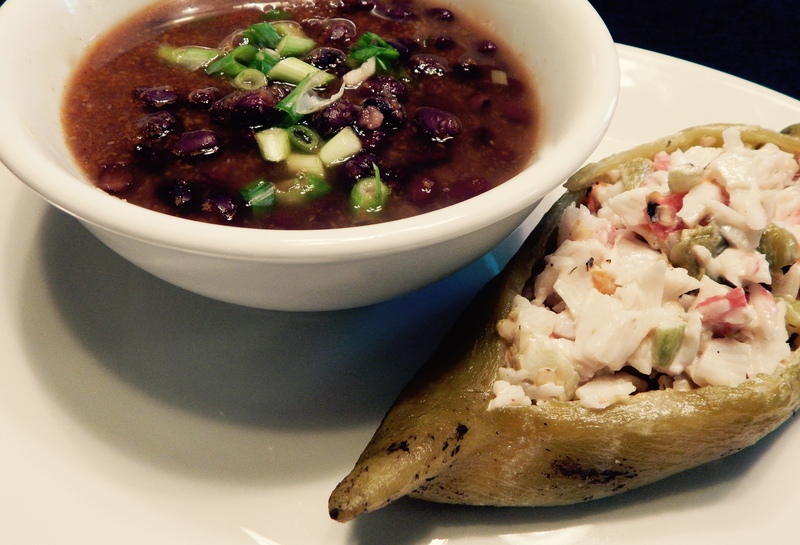 When the beans were warmed through, I had a great dish that brought together a couple of favorites in a new way. Sometimes it is fun to play with your food and see what happens. Halved grape tomatoes starting to blister in the pan. Mix it all together in the tomato pan and warm it through. You can moisten it with chicken broth but don’t make it soupy! Plate it up, add a little grated parmesan and a favorite souper supper changes into a super supper!